I'm trying to find a DC gear motor (worm drive) capable of lifting up to 100kg via an Xcm pulley (size dependent on RPM). So 981newtons. Assume I need a range of about 75cms, and I'd like to be able to traverse the range in about 20 seconds. So, if I had a 1cm diameter pulley, I need to find a motor capable of pulling 5Nm at around 75rpm. The closest match appears to be this wee fella: http://uk.rs-online.com/web/p/dc-geared-motors/7736771/ However, the datasheet claims a "nominal" torque of only 3Nm, but a "starting" torque of 25Nm (at 34 amps ) I'm thinking this will probably do what I want it to do, but I'd just like confirmation from someone more knowledgeable than me: If I were to need 5Nm continuously for up to 30 seconds, would I be asking too much of this motor? Hell of a price! Try a car window motor from the junkyard its probably the same thing! 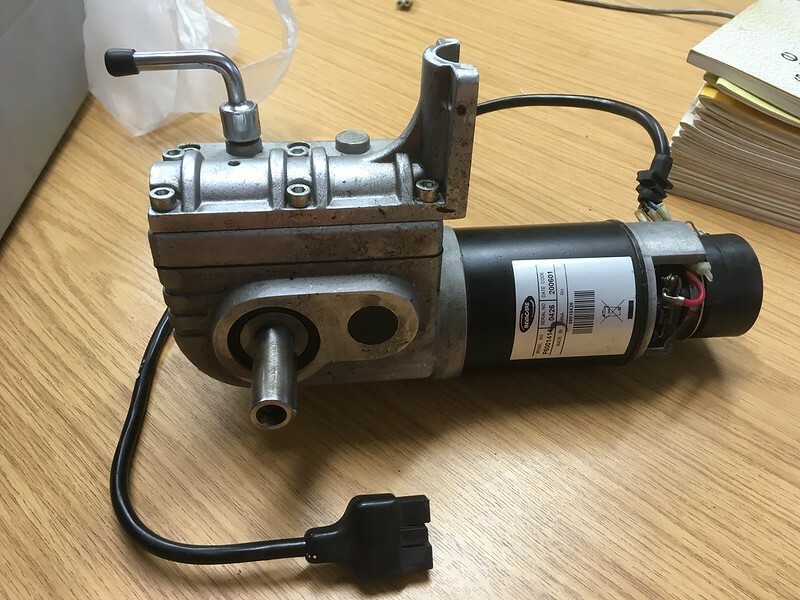 There is a chap on the MIG welding forum who not infrequently sells second hand electric actuators, a bit like a hydraulic cylinder but contains a screw and nut and electric motor. I think they come from scrapped hospital beds and bath lifts. Perhaps you can find something similar as they sound ideal for your job and are cheap and compact. 1 cm seems an awfully small pulley- if it is conventionally-rigged the wire will only have just over 1.5 cm in contact with the pulley, so you’d need to create something like the drum-end on a mooring winch with multiple turns. How are you guiding the bench so it is constrained in X and Y – will that add frictional losses? If it must be 'push' from underneath alone, then maybe add a set of gas-springs to reduce the load? Is there any chance you can rig this as a suspension? – could make things easier and you could add a counterweight to null-out the static weight of the bench? And you could then even automate it with an aquarium pump or similar! – empty tank atop your counterweight, reservoir tank nearby, elevate = pump water into counterweight tank, lower = run water back into reservoir? Seconded, these are neat and can produce prodigious force. The ebay ones tend to wear quite quickly in gate opening applications (YMMV) but for raising a bench every now and then they should last forever. You need two DPDT relays to drive them and they often have limit switches built in. Tom - that's probably not a bad idea... and will be way cheaper than the motor I found. I've actually got one kicking around somewhere out of an old Ford. The only thing I'd be concerned about is whether they've got the strength in them. Linear actuators - very interesting indeed! They'd make the mechanism much simpler, that's for sure. The only downside is, I reckon I'd need 3 or 4 of them, one per leg, and getting them perfectly synchronised might be tricky? Don't want the bench going up wonky, all my stuff might roll off! Fat legs each with a hydraulic cylinder inside, where the floor end tube surrounds the table top tube sliding one in the other. Commoned up to a small hydraulic pump. Power steering pump would probably do. No complex mechanics to jam and heavy loads should be no issue. Like the idea Andrew - a couple of issues though; the rams are chuffing expensive (for the stroke I want, you're looking at pushing on for £100 per ram, and I need 3 or 4); unless they're identical, tuning them might be tricky? Plus then I need control valves etc. If using wire rope, perhaps consider some kind of safety device in case of rope failure (maybe similar to that in 4 post car lifts). A hydraulic arrangement tends to 'fail slowly' but might still warrant some additional measures. Linear actuators might need a brake to ensure they 'stay put' on power failure. Fascinating fun! Any use for a counterweight on a pulley to ease the load some on whatever method you choose? If its a single acting ram only the rod needs to be smooth/acurate, with a suitable seal in the bore of the gland. The tone just acts as a guide the force is X psi times the cross sectional area of the shaft. For simplicity I'd go for a wire at each corner. It'd be easy to adjust the length with a rigging screw or eyebolt. You could also incorporate counterweights to take the static load. I'd then connect all 4 wires to your chosen actuator so they were always moving together. If you want greater travel than your actuator gives then you could use a pulley to double the travel if the actuator is powerful enough. I think I've seen drawings for similar devices for hoisting model railways up to the ceiling. Any hammer pounding or vise wrenching going to be happening on this bench, or is it strictly for electronics/soldering, etc? Cable suspension only supports down loads. Seems like a locking telescoping leg mechanism (rachet, pin in hole, etc.) would be helpful as separate from the actual lift mechanism, unless it's a jack screw lift. Would a variation on the scissor action bike lift suffice? OK, I think I'm going to rule out hydraulics. It's an interesting idea, but I don't like the idea of having all that oil kicking around in an office space, it's going to be dirty enough as it is, and I can guarantee I'll add a few leaks along the way. I may build a rise/fall bench for the workshop one day that uses hydraulics. Counterweights - yes, I could build in counterweights I guess, but I don't really want things hanging down under the bench where my knees will go if I'm sat at it, besides, I don't think I'll need them. I'm hoping that speccing 100kg for the weight of the bench is total overkill... so the 5Nm motor should be more than capable (and if I do buy the expensive one, and it IS capable of providing up to 25Nm for brief periods, then it'll well lift the bench even if I lie down on it! So, I have another thought, which is basically a variation on the linear actuator: Rather than having individual actuators, have a long ACME screw in each leg driven by a sprocket at the top. Then run a chain all the way around, driven by a single motor. That way, all the legs would rise/fall at the same rate (provided the chain stayed on!). Going around corners would be easy with additional sprockets. I can probably get away with using bicycle chain & gear sprockets which should be cheap as chips on eBay. Plus I can adjust the gearing (on the fly if I put a Shimano gearset on the motor ) This would also be self-locking, and the legs wouldn't need to be ginormous. The only "interesting" part would be the screws; but I have a lathe.... so I could make my own Furthermore, if I didn't fancy running a chain all the way around the underside of the bench, I can always run a long driven shaft & simply take drive off it next to each leg. That would require bevel gears to turn the drive 90 degrees (I would want the sprockets horizontal, not vertical), it would also mean shorter chains = less sag between each leg, but it does make it a bit more complicated. Re: the wire rope & safety (i.e. if it snapped) - each leg would have it's own rope/drum, albeit driven off a common shaft. So if one snapped, it's not ideal, but the bench should stay up on the remaining legs. However, as it would be effectively suspended on the wire ropes, it's possible there will be some "bounce". There will be no hammering or pounding (other than in frustration!) going on, it's purely for electronics & computer stuff. Anyway, lots of food for thought, please keep the ideas coming, I'm getting quite excited at the thought of building this thing! So, I have another thought, which is basically a variation on the linear actuator: Rather than having individual actuators, have a long ACME screw in each leg driven by a sprocket at the top. You could reduce the length of the screw to just longer than the adjustment range needed, with the rest of the leg being solid. Or maybe a pipe with a cap welded on. You could then use a standard bit of threaded rod. We can get that as Acme or just ordinary all thread. If thick enough the ordinary stuff would work. 3/4" by 10 tpi is available in hardware stores here in 3' lengths. Metric must be available similarly. Weld some long nuts to a plate for a pipe cap and you have the mechanism. Surely the ideal design would be driven by a single actuator, no problems with maintaining even movement, no complex interlink mechanism? A scissor lift style is out because you can't get your knees under it, but what about a cantilever design as found on a forklift? An 'L' shape frame on the floor, with the upright part at the back, uprights consisting of two rails spaced, say, 500mm apart, a plate with 2 pairs of bearings sliding on the rails, with a linear actuator in the middle. Bench top cantilevered out from the plate. Four 1meter lengths of 20mm studding with timing pullys , as in a mill knee . In this case, a decent sized gear motor! This is one of a pair of wheelchair motors I was given some years ago by John Bogstandard, so it'll be good to finally put them to some use (or one of them at least). I don't know how powerful they are, but they turn at about 60rpm @ 12v, which seems to be right around where I want the speed.I can always bump up the voltage ifI want to run them faster, for the length of time the motor will be running, I can't see it being a problem. There appears to be an encoder on the end as well, although why I am not sure, and there's no connectors to it. The two extra pins in the plug are not connected to anything. I can remove the bracket and the clutch lever (I will simply leave it permanently engaged), and will weld up a bracket to hold it to the underside of the bench. So, I've worked out that ideally I want about 600mm of travel, from around 700mm to 1300mm. I could possibly get away with less (which would also make any leadscrews cheaper), so I may settle for 500mm & start at 720mm (standard desk height) and only go to 1220. So, I guess another question would be.... what size threaded rod? I can pick up 16mm ACME threaded in 1m lengths for a surprisingly low price on eBay, 20mm costs a bit more but I'm wondering if the extra thickness would provide additional stability. Having said that, I do intend to use close-sliding-fit tubing, the outer leg will be fixed to the floor & the inner leg is what it actually sits on, the overlap should prevent too much side-to-side wobble, especially combined with the linear bearings. But would 16mm possibly bend under,say, a 200kg load (weight of bench+contents+me leaning heavily on it)? I think if I do Charles' idea of one linear actuator,I'll go out to a 30mm screw, that should be plenty surely? PS: The other advantage of using leadscrews over ropes, is setting the initial leg height is dead easy: Just rotate the inner leg until it's firmly in contact with the ground. I'll probably turn up a small end plate which screws to the ground to prevent it from turning when the bench is raised/lowered, which will be screwed in once the height is set. Sussed it out - I can guess what you're up to! "Bed" rising on leadscrews = Z axis, then all you'll add later is a lightweight X/Y gantry above to carry as many printheads as you want => mega-3D-printer!